Powershare files to release with full priority without having to unshare any files. You can set files to be powershared by right clicking them in the shared files list and selecting "Powershare" -> "Set powersharing". 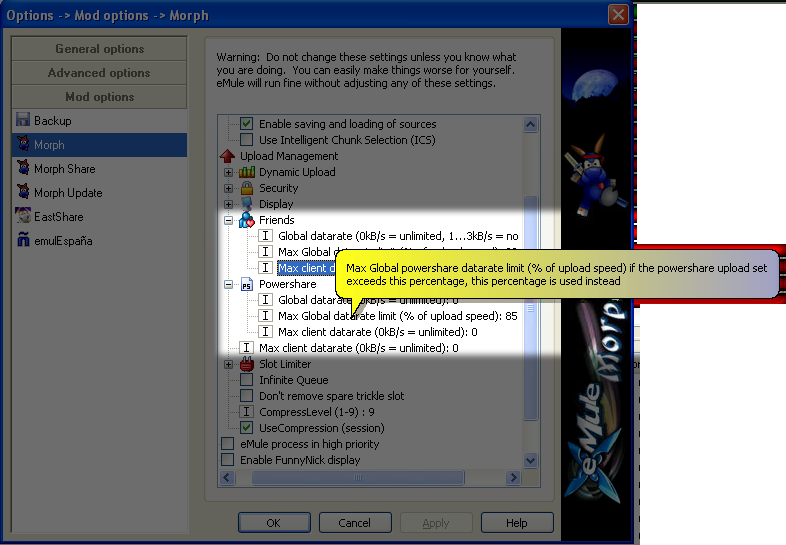 Files that have powershare activated will be uploaded a 100% of the time, if there are people trying to download them. It doesn't matter how many other files you share or download. This makes it possible for you to release files efficiently, and still download files normally. If the files with release priority doesn't use all the bandwidth, normal shared files are uploaded. This means that you won't have to unshare everything that you are not releasing. This gives more sources for files on the network, and make sure the allotted upload bandwidth are always used a 100% efficiently to release your files. If PS is deactivated by default it is still possible to powershare some files in the Shared Files section through the context menu. PS is activated by default. You can set a limit for PS. You can do this also in the Shared Files section. If the Mod detects as much complete sources as you've entered as limit then it will deactivate PS for that file. This setting is very useful for releasing multiple file in a row. Just set te limit to a low number (3 to 5) and the file will stop getting powershared automatically. ZZratio If you PowerShare a temporary file: you will get a Ratio of 1:3. This page was last modified on 6 May 2010, at 22:07. This page has been accessed 10,862 times.